DefconBots is returning again this year with their shooting gallery robot competition for Defcon 16. They’ve decided to leave the rules unchanged from last year. 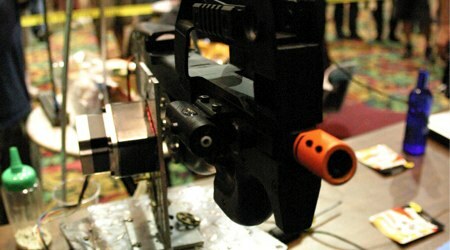 It’s a head to head competition between fully autonomous guns. The first gun to shoot all the targets on their side of the board wins. The rules aren’t very strict on design; as long as you use nonlethal nonmessy amunition and include a safety switch you’re pretty much good to go. The DefconBots site has a reference design to put you on the fast track to competing. Defcon 16 is August 8-10, 2008 in Las Vegas. Idk, if they got good enough, I’d rather have an unnerving, but consistent armed robot watching my back than some easily startled rookie with a reflexive trigger finger. Yes, its possible that it may kill me in error, but its not as if the alternatives couldn’t do the same. Personally, I’d feel safer with whichever one proves to be less error prone, which could very well be the robots. Humans are hackable too btw, except, in our case, the word for it is propaganda. Hey just a thought, you would probably get more readers if you interviewed controversial people for your site.